IPsec VPNs have been around for decades to secure connections across data centers, and now Clouds. While necessary, historically, IPsec VPN gateways are very expensive. Security in general is very expensive. 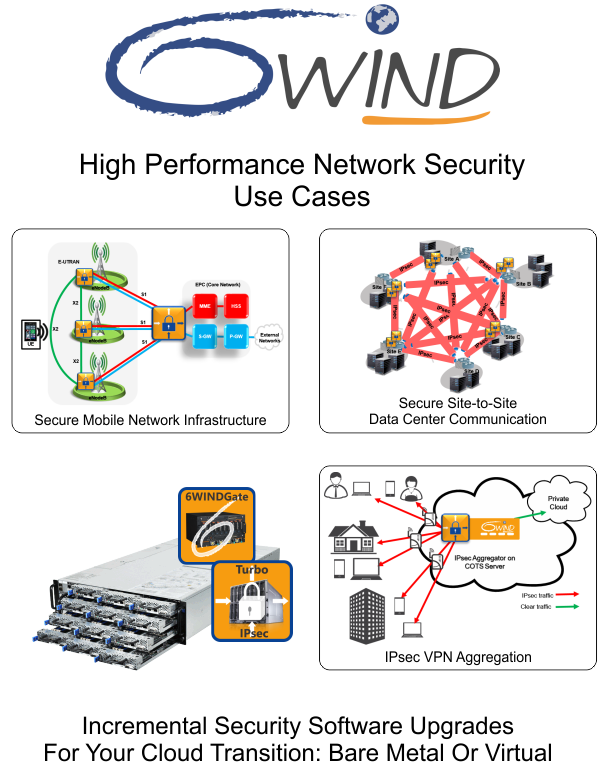 6WIND software helps OEMS and Network Builders design high performance IPsec VPN solution on Commercial-Off-The-Shelf (COTS) servers with cost savings of 50 – 80% versus specialized hardware. These include Securing Mobile Network Infrastructure and Secure Site-to-Site VPNs. For each use case, our software is deployed in two different scenarios, bare metal and in virtual machines for NFV. It is the same software for both scenarios. 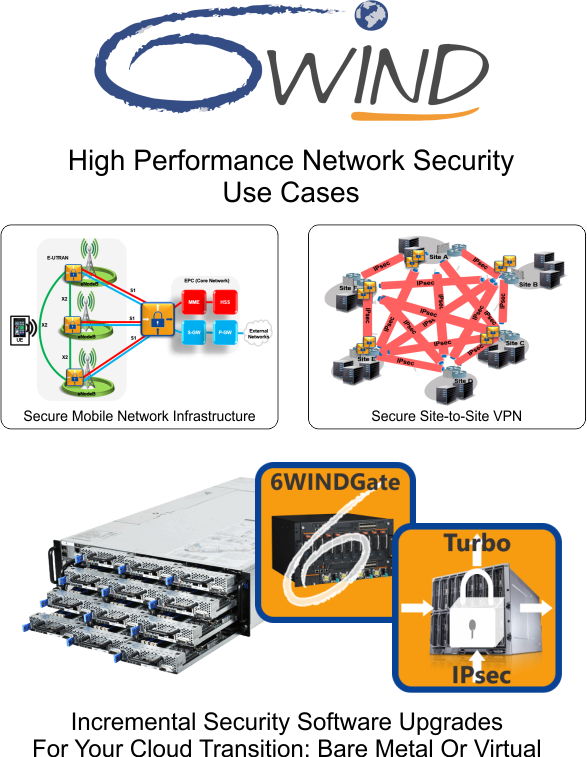 6WIND’s software gives OEMs and Network Builders bare metal and virtual deployment options to design hardware and software network security solutions. 6WIND Turbo IPsec Appliance: Ready to use software appliance available for bare metal and VM configurations (firewall and IPsec VPN gateway) that delivers unrivaled networking performance for Layer 2, routing, firewall, NAT, IPsec, IKE and more. Telcos Create your own, high performance, customized and open network security software appliances based on 6WIND technology on standard servers to reduce your networking CAPEX, improve your network security and accelerate service creation. Network Equipment Manufacturers Reduce development costs and increase margins for your new generation of high performance network security appliances based on 6WIND technology. Platform Vendors Provide the industry with high performance ready-to-use security appliances using your platforms with 6WIND technology.